Theme events are always a lot of fun especially when the era is a decade close to your heart. 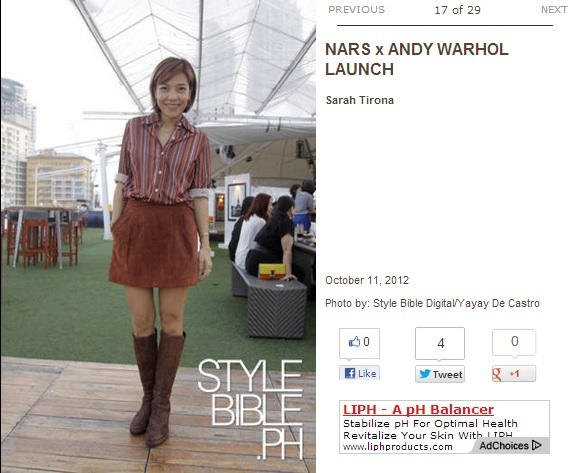 The Andy Warhol X NARS event required invitees to either go in colorblock or 60s/mod inspired outfits. I just wore a colorblock outfit the day before so I didn't feel like putting together another outfit based on colors. Instead, I decided to go the vintage route and this shirt Denise gifted me recently was perfect for what I had in mind. Nothing quite spells 60s fashion than mini skirts and knee-high boots...I just wish I took the time to primp myself up more during the photo session. Looking at the photos, don't you just feel like fixing my collar or adding a little more "smile" on my face? That's also the thing, I am physically incapable of faking a smile. No matter how hard I try, it always comes out sorta wrong. So when you see me with a smile like this, you'll automatically know something's bothering me. This was one of two days I didn't post an entry due to "personal issues" which sad to say are still lurking around but in a much more manageable way. Oh the perils of the real world. So sorry to post somewhat of a heavy spiel right on a dreary Monday morning. Will try to better tonight. In the meantime, winning a pair of Ray-Bans just might brighten up your week so why don't you pop on over to their facebook page and give it a try.